Here you learn the HP printers that are recommended installing ink system, follow the steps below and if you have any questions, type a comment. Then a publication to recommend installing an ink system to the HP brand equipment, must correctly interpret this post but will be more than clear about the systems and the models of this brand that will work correctly or better. In one of the first publications to made on this blog, we have +José Altagracia Paredes made a mistake must accept, for that we are — accept mistakes and move on — it was because they did not know the quality and installation of the ink systems Canon printers, put these on the floor and let Epson, Brother and any other brand that has ink cartridges without sponge inside at the top to make this adaptation printers. The case is that here and with the most experience — and waiting the readers of this blog have it too — have made everything possible to make a functional installation or at least without mishap. If we can make a ten to function properly, or take one of my printer HP "late model" brand and make installation and take her home, but not what actually happens with printers sold to a person who not have much knowledge of this. Those using more printers, even the technical area, are who do not know of it, your job is another branch that depends on the printer, but not has knowledge a lawyer, teacher or student. I have come to a conclusion, personal which can take any reader as his own, because born after a long time, watching the way to install HP printers with cartridges 122, 662, 61 among others, without satisfactory results. The title speaks to printers, so this should not make fall their hopes, means there are printers that can be made installation of continuous system, but these are special cartridges that have no sponge inside, as you can often call head printers, and we talked about because printers with cartridges sponge inside — at least for the HP brand — not working properly install the continuous ink system. HP cartridges with sponge inside, unlike the Canon is different the way it works, just try to fill an Canon ink cartridge and refill HP ink cartridge, if you put one hole for the ink until it is voted on HP cartridge, make up the holes, whereas the Canon printer if you fill up not supporting more ink, the ink will vote only for the head injected in the same manner as when the printer performs the function. Canon printers are ink absorbing work like cleaning tool, preventing clogged nozzles, and keeping the cartridge in good condition for a good quality print almost all the time. The latest manufacturer HP printers are the least recommended for continuous system installation, if you use ink cartridges low yield such as 301, 122, 61 become damaged frequently limiting the equipment to print small quantities of pages with a single cartridge without replacing it. Ink cartridges of the latest printers that work like ink tank and have a separate head, this is the case of No. 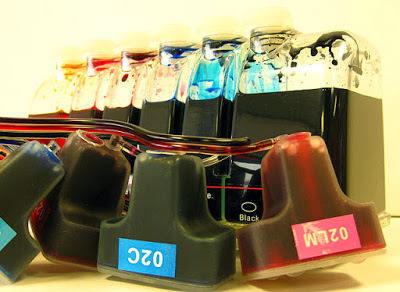 950 to do an installation of ink system, and many more high-performance printers, if something is important and we should put ink cartridges, usually used water-based ink in the cartridges to color and pigmented black ink cartridges.